We calculated that running our SSV data warehouse on AWS would be about a third of the TCO of hosting and licensing the data warehouse on traditional technologies. With more than 4 million members and more than 20 million visitors to its properties each year, the National Trust is the largest membership organization in the United Kingdom. Its core purpose is to “protect historic places and spaces—forever, for everyone,” and since its establishment in 1895, it has done just that, focusing on the preservation of historic houses, landscapes, and gardens. The Trust relies on its network of about 67,000 volunteers and up to 15,000 employees, depending on the time of year, to keep its extensive operations running smoothly and to give its members and visitors excellent experiences across the UK. The National Trust was looking to create a data warehouse—referred to as the single supporter view (SSV)—that would hold data from multiple operational systems, including those for CRM, events booking, and the online shop. The aim? A 360-degree view of members and other supporters, including when and where they interact with the different arms of the organization. This insight into supporter interaction with the Trust would be revolutionary in terms of its marketing potential, ultimately helping one of the UK’s best-known charities to continue its work protecting the country’s heritage. The challenge for the Trust was twofold. First, it needed to find the right IT solution to get the SSV up and running. And second, it had to ensure that the technology would evolve along with the organization’s larger strategic initiatives, and do so cost-effectively and without disruption to the business. 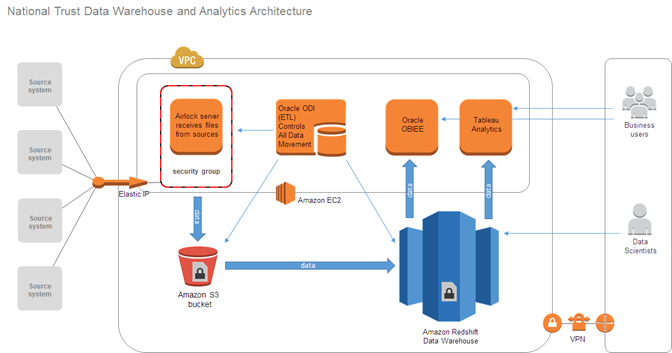 The data from the Trust’s disparate source systems is brought into Amazon EC2, encrypted, and then loaded in Amazon S3, from where it moves into Amazon Redshift. After this, processes are triggered from ODI that merge the data into a single view. Dealing with vast amounts of membership and supporter data meant that security was an important requirement for the Trust. “Our data is hosted in Europe, which is crucial for us from a security perspective. With AWS, we have complete control over where and how data is stored, and who has access to it. This control, along with the extensive encryption, means we feel safe. We know the Trust’s data is protected,” says Brambley. And, with the system’s big capacity to scale, the Trust knows its current 3TB of data can easily be doubled or tripled without a corresponding increase in costs. “The benefit of building this system on AWS is that if the Trust decides it wants to bring in twice the amount of data, there will only be a 20 percent increase in price. However, if we built it using traditional technologies, we’d be looking at a whole hardware refresh, potentially doubling the price, if not more,” says Brambley. A Standard Partner of the AWS Partner Network (APN). UK-based Sirocco Systems designs, builds, and manages enterprise information systems. For more information about how Sirocco Systems can help your company run on the AWS Cloud, see Sirocco Systems' listing in the AWS Partner Directory. To learn more about how AWS can help with your data warehouse needs, visit our Amazon Redshift details page.